Good Foot, party band, packs dance floors! 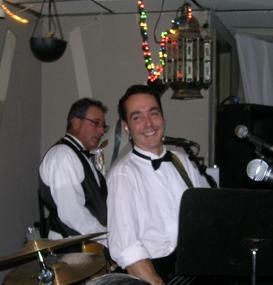 Plays clubs, weddings, holiday parties, in Pennsylvania, New Jersey, Delaware, Maryland. Great musicians, Rock, R&B, Motown, Oldies, Dance music! GoodFoot, Never sit down! West Chester, PA - R&B dance rock party band Good Foot has been packing dance floors in South Eastern Pennsylvania, Maryland, and the New Jersey Shore for the past several years! From Downingtown PA to Avalon NJ, from Main Line Philadelphia to the Delaware beaches, from Chesapeake City on Maryland's Eastern Shore to Atlantic City on the Jersey Shore, this band rocks! With Leon Spencer's soulful lead vocals and percussion, Chuck Whiteman's rockin' vocals and saxophone, Mickey Rast's gritty vocals and pumpin' bass lines, Jimmy Littman's exquisite guitar riffs, Doug Wolfe's consistent drumming, this band is tight! And with David Zipse on keyboards, this SIX member band sounds like ten! These great musicians have fun playing together, and FUN IS CONTAGIOUS! If you like Dance Music, R&B, Motown, Oldies, Rock, 80's, 90's, and some current hits, and you're looking to hire a wedding band, or entertainment for your next party, definitely CHECK THIS BAND OUT! With GoodFoot providing wedding music for your reception, or dance music for your holiday party, anniversary or birthday celebration, your guests are sure to have FUN and dance the night away! Just watch the VIDEOS and read the TESTIMONIALS from previous clients below! Serving the Delaware Valley, Pennsylvania, Maryland, New Jersey and Delaware; including Center City Philly, City Line Avenue, Northeast Philadelphia, South Philly, Conshohocken, Radnor, Newtown Square, West Chester, Downingtown, Coatesville, Lancaster, Harrisburg, Reading, new Hope, Delaware County, Chester County, Bucks County, and the Poconos, the Jersey Shore, Atlantic City, Toms River, Ventnor, Margate, and Longport New Jersey, Linwood, Somers Point, and Ocean City New Jersey, Sea Isle City, Avalon, Wildwood, and Cape May NJ; the Delaware Beaches including Rehoboth Beach, Dewey Beach, Bethany Beach, Fenwick Island, and Ocean City MD, Salisbury, Easton, Cambridge, Annapolis, Washington DC, Baltimore, Bel Air, Aberdeen, Elkton, Havre de Grace, Trenton, Cherry Hill, Runnemede, Swedesboro, Port Penn, Pennsville and Penns Grove New Jersey; Centreville, Greenville, Newark, Wilmington and Dover, from their home in the Brandywine Valley. Packing dance floors at various weddings and clubs! 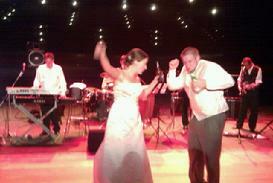 Best Man & Bride play bongos with the band! To review our pricing and booking procedures, click here. Had a great time with this band! I would tell you to book them for any and all parties! What a fantastic Wedding Band!! Goodfoot is a talented group of musicians that just set the mood for the party. 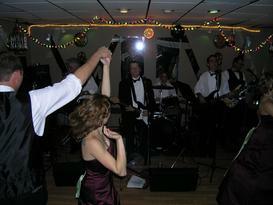 Everybody commented to me what a great band this is and how it made the wedding so much fun. The dance floor was packed the whole time, with people aged 10 to 100! Yes our 100 year old uncle could be seen on the floor busting a move! I want Goodfoot to play at all of our parties from here on in. I would highly recommend Good Foot! Before the wedding, I was in touch with David Zipse, who was wonderful about staying in touch with me about details and taking any requests from us about what we did and did not want. At the wedding, all of the band members were professional and courteous and greatly contributed to making the evening fun for all of our guests. The music was perfect for a multi-generational crowd � everyone was up and dancing all night! Guests raved about the band afterwards. We are so thankful we found Good Foot - I could not imagine a better band to help celebrate any occasion! Good Foot handled our special requests and learned songs for our wedding. They were extremely dependable and always answered our emails promptly. We received several compliments on the band, who also played for the ceremony and cocktail hour. Great job! GoodFoot is a great band. Very professional, very talented and a lot of fun. I would recommend them for any event. We had a great time!!! You guys sounded great! I appreciate the extra time you took to learn the songs that I requested, especially the Isley Brothers tune at the end. The music sounded professional and you all looked great as well. You are very talented and I would use you guys again with no hesitation. Thank you again for everything! We hired Good Foot for our annual summer lawn concert and were extremely pleased. They are highly talented, entertaining and professional. We would absolutely recommend them and plan to hire them again next year. I have nothing but great things to say about Goodfoot and David Zipse. 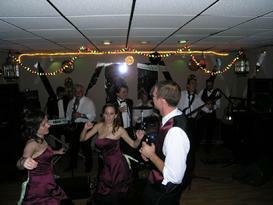 The band was very professional, talented and overall just fun to have at a wedding. We received many compliments the next day on the choice of a live band over a DJ, and all of our guests had a great time. The band was very accommodating to all our requests and helped make our day very special! Good Foot was phenomenal!!! They were the best band I have ever hired. This band played something for everyone -- a good mix of 50's through 90's. The sound was incredible. Hire this band!!!! Would you like to book GOOD FOOT? Have you heard Good Foot somewhere? What did you think? Please, tell others, for word of mouth is our best advertising! in the entire U.S. & Canada! Thanks to all of our previous clients! REDDING, Conn., March 16, 2010 - GigMasters.com, the number one event entertainment booking service, today revealed its annual "Rising Star Award" winners for 2009. The 129 winners represent the highest earning entertainers in their performance category. Winners were selected from GigMasters database of over 7,000 top-quality, client-rated event entertainment acts, across the United States and Canada.